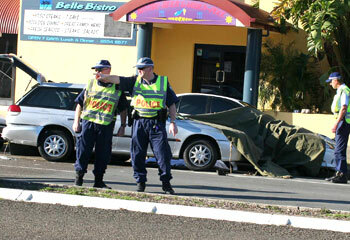 The scene… where two off-duty police officers were struck by a car on the NSW mid-north coast today. AN off-duty policeman has died after being pinned between his car and a second vehicle which crossed to the wrong side of a road on the NSW mid-north coast, police say. Senior Constable Paul Morris, 40, died on Wharf Street, Tuncurry about 12.55pm (AEST) today after he was struck by the car, NSW Police Commissioner Ken Moroney said. Mr Moroney said a second off-duty officer, a 36-year-old woman, was also injured in the incident but had been treated and released from Tuncurry Hospital. “We understand at this time that a motor vehicle approached from the opposite direction and, for reasons yet to be established, it appears to have mounted a median strip,” Mr Moroney told Southern Cross Broadcasting. The incident was witnessed by fellow officers, police said in a statement. Mr Moroney said the policeman was a single man who was “close friends” with his female colleague. The driver of the other vehicle had been taken to hospital in a state of shock, he said. Mr Moroney and Deputy Commissioner Andrew Scipione were tonight on their way to Tuncurry. Police Minister David Campbell offered sympathy to the families of the two officers. “Our hearts go out to their families,” he said. Highway patrol officers “held back tears” as NSW Police Commissioner Ken Moroney offered them support over the death of an off-duty colleague in a freak car accident. One witness told police Senior Constable Paul Morris died as he pushed his girlfriend, an off-duty officer who was injured in the incident, out of the way of an out-of-control car on the NSW mid-north coast on Tuesday. Snr Const Morris, 40, died on Wharf Street, Tuncurry, about 12.55pm (AEST) after he was struck by the reversing car that pinned him to his own vehicle, police said. A 36-year-old woman, who was in a relationship with Snr Const Morris, was also injured in the incident but had been treated at Manning Base Hospital and discharged. Mr Moroney and Deputy Police Commissioner Andrew Scipione rushed to Tuncurry late on Tuesday to console local officers, some of whom saw the fatal collision. Tony Ritchie, spokesman for the commissioner, said Mr Moroney and Mr Scipione also visited Snr Const Morris’ parents on Tuesday night to offer their support. “There was a gathering of highway patrol officers in another house,” Mr Ritchie said. “They walked through, shared the comfort, shook hands and watched as big men held back tears as they talked about friends. Mr Ritchie described the collision near the Bellevue Hotel, a favourite haunt of off-duty police, as “freakish”. He said it appeared the car that hit the officers, described as a silver Subaru station wagon by one witness, became locked in reverse as it tried to park. Another witness told police the car’s tyres were smoking as it veered out of control, he said. “(Snr Const Morris) was standing on a median strip, he was just about to walk across the road to get into his car,” Mr Ritchie said. “He had to literally walk across one lane to get into his car and (another) car in some bizarre way somehow locked itself into reverse and comes veering across one lane … over the median strip and knocked him further across the road into his car. Mr Moroney’s spokesman said police were still looking for witnesses but one had told them Snr Const Morris tried to save his girlfriend. “One of the witnesses said he’s pushed her out of the way as the car’s come across the road,” he said. Mr Ritchie said police were still considering whether it was appropriate to charge the driver of the Subaru, who was also injured in the incident. THE distraught girlfriend of a policeman who died while pushing her from the path of an out-of-control car has described how the hero officer’s actions saved her life. Tracey Fergus was yesterday suffering physical injuries and a broken heart after the death of Senior Constable Paul Morris, her boyfriend of four years. As the couple crossed the main street of Tuncurry, on the NSW mid-North Coast, on Tuesday afternoon a car suddenly reversed towards them. Sen-Constable Morris tried to push Ms Fergus, who is also a police officer, out of the way, but both were struck by the vehicle. The off-duty highway patrol officer took the full force of the car and died at the scene from massive injuries. “That was Paul, he tried to push me out of the way as best he could,” a shattered Ms Fergus told The Daily Telegraph yesterday. Nursing visible injuries from the incident, Ms Fergus smiled as her boyfriend’s family told of his three great loves – his girlfriend, his family and his fishing. “I sometimes wonder if fishing might have come first,” Ms Fergus said with a smile. Just three weeks ago, Ms Fergus organised a surprise 40th birthday party for Sen-Constable Morris. “I didn’t know whether he’d kill me for organising it or if he’d be OK about it,” Ms Fergus said. But there was no mistaking how the policeman felt about the gesture. The investigation into the incident continued yesterday, with crash unit officers from Newcastle closing off Manning St in the town centre while they retraced the pair’s movements. Sen-Constable Morris and Ms Fergus had been to a shop and were on a median strip waiting to get back to their car when the accident happened. “It looks as if he’s been reversing back and somehow he’s come spearing across and hit the two officers, who were standing on the median strip,” a police spokesman said. The 61-year-old male driver of the car was assisting police with inquiries late yesterday. A full police funeral will be held for Sen-Constable Morris next week. 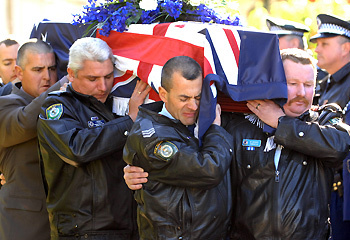 “He was a terrific policeman and he had the best group of workmates you could ever have,” his mother said. The officer’s grieving colleagues visited his family after the accident, as did Police Commissioner Ken Moroney and Deputy Commissioner Andrew Scippione. Workmates struggling to come to terms with the popular officer’s death have been offered counselling. A DEVOTED partner, professional colleague and great mate is how Senior Constable Paul Morris will be remembered. His three great loves in life were his partner Tracey, his family and his fishing, although not necessarily in that order – his brother Peter revealed at his funeral service. Hundreds of people attended the full police funeral at Taree’s Our Lady of Rosary Catholic Church including Commissioner Ken Moroney, Deputy Commissioner Andrew Scipione and colleagues from Sydney and the Manning Great Lakes. The Manning Great Lakes highway patrol officer was killed in a freak traffic accident in Tuncurry last Tuesday. In an act of bravery, the off duty officer who was standing in Manning St with his partner Senior Constable Tracey Fergus, jumped in front of her, protecting her from an out of control car which had crossed the median strip. He bore the the brunt of the impact and later died at the scene. Senior Constable Morris joined the NSW Police Force as a trainee in 1988 and later assigned to Windsor following successful training. 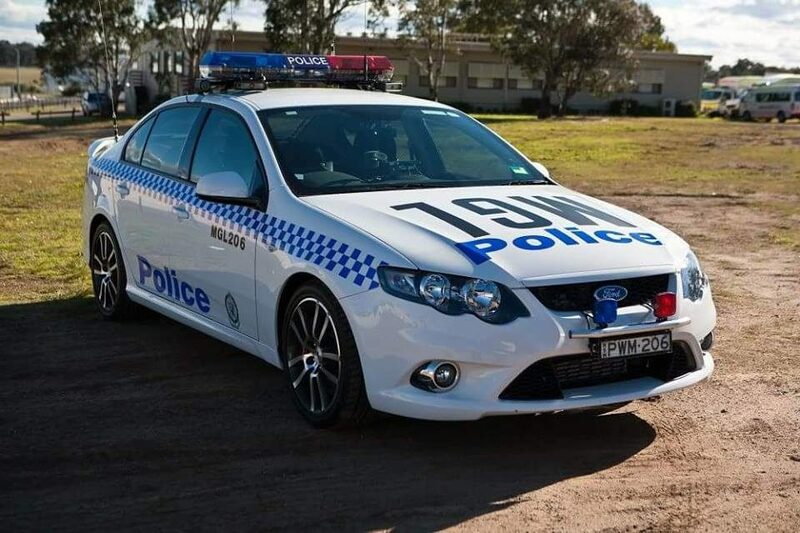 He moved into the highway patrol sector and this included a nine year period with the Penrith Highway Patrol. He successfully transferred to Manning Great Lakes Command in April 2005 where he continued his role in keeping the road toll down. 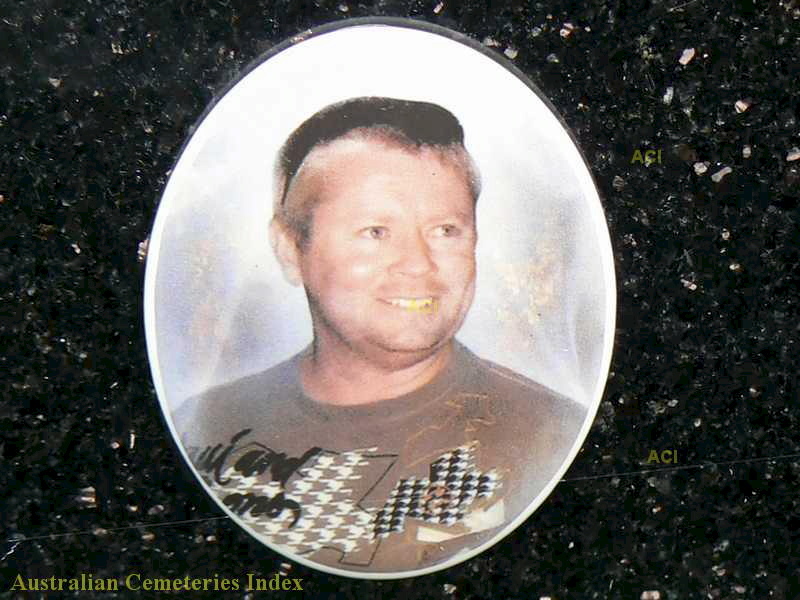 Commissioner Moroney said Senior Constable Morris’ death was a tragic loss. He added he was honoured to confirm Senior Constable Morris had been appointed a posthumous commendation for bravery in recognition of his actions in Tuncurry last Tuesday when he put his own life on the line to protect his partner Senior Constable Tracey Fergus. Peter told the congregation his brother’s death had left a huge hole in their lives. “We have lost our best mate,” he said. “While he may not be here in body he will be here in spirit. 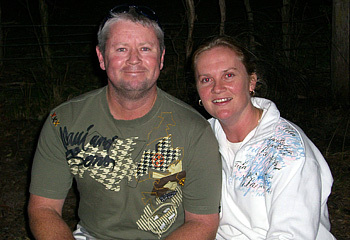 A message read on behalf of Tracey gave a true picture of her life partner. “He was a true gentleman. He was my soul mate. Not a day went by when he didn’t have a smile on his face or come out with a cheeky one-liner. “It’s not often in a lifetime you meet a man like Paul Morris. Local Area Commander Superintendent Peter Thurtell said Senior Constable Morris was a true professional, working hard to keep local roads safe. “Paul was our friend and he will always be. “Paul was our colleague and he will always be. “Tomorrow and beyond the police family will now turn its attention to Tracey. Senior Constable Paul Morris posthumously received the Certificate of Service, Region Certificate of Appreciation and State Emergency Service Medal. ON crutches and visibly injured, Tracey Fergus yesterday recalled the golden heart of her hero boyfriend who sacrificed his life to save hers. 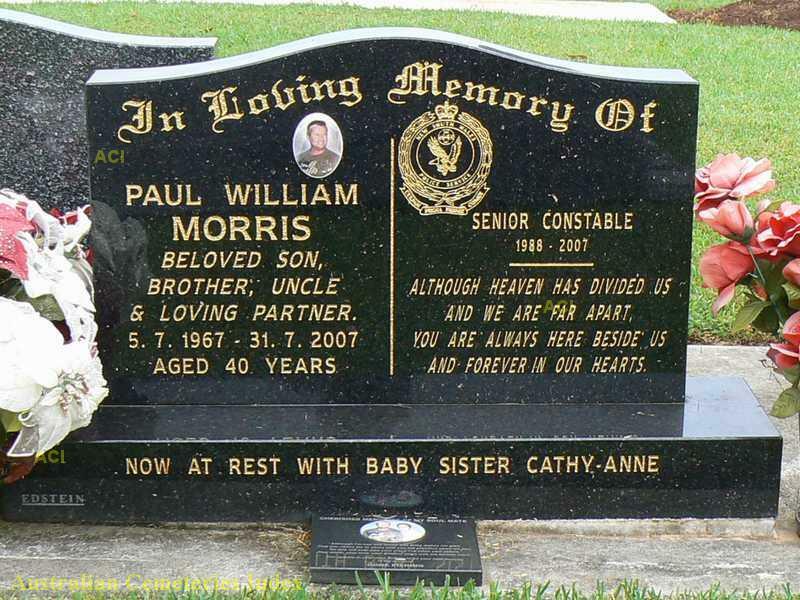 The injured policewoman smiled bravely as she accepted a police valour award for Senior-Constable Paul Morris at his funeral service. He was killed last Tuesday while pushing Ms Fergus out of the path of an out-of-control car. The couple had been crossing the main street in Tuncurry, on the mid-North Coast, when a car driven by an elderly man veered towards them. Police Commissioner Ken Moroney told mourners at Our Lady of the Rosary Catholic Church in Taree that it was the quick-thinking actions of Sen-Constable Morris in pushing Ms Fergus out of way that saved her life. “He is awarded for his selflessness and courage and for the swift and evasive action to remove his partner out of harm’s way,” Mr Moroney said. In tributes farewelling the officer, the congregation heard of Sen-Constable Morris’s love of life, his family, his friends and his job in highway patrol – a role he carried out for 19 years. “He was a highly regarded and respected man who served the community with courage, honour and distinction,” Mr Moroney said. Despite her injuries, Ms Fergus smiled graciously as she accepted the Police Commissioner’s Commendation for Courage medal on Sen-Constable Morris’s behalf. In a eulogy read on her behalf, Ms Fergus said Sen-Constable Morris was a gentle, loving and caring man who had a heart of gold. “Paul was a true gentleman not a day went by when he didn’t have a smile on his face,” Ms Fergus wrote in the eulogy. Superintendent Peter Thurtell described Sen-Const Morris as the “consummate professional” with an love of highway patrol. At the end of the funeral service, Sen-Constable Morris’s coffin was driven through a guard-of-honour, formed by officers who gathered to to farewell their colleague. In a tribute to the highway patrolman, the procession was lead from the church by his former police car, Manning 206.